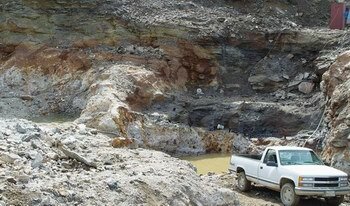 Encouraged by our modest finds in April, we resumed mining the pegmatite with re-newed vigor in May. As we worked further down dip we had to deal with an increasingly thick layer of schist. The schist was now 8-10' thick in the western corner in which we were working. I know various observers were puzzled why were subjecting ourselves to this unnecessary work when we could have easily gone to eastern end of the pit. There we would have only to deal with 3 to 4' of overburden. In addition, both Merrill and Perham had had some success there. The plan that had been in my mind from the beginning was to come into the pit from the western end, mine to the existing high wall taking the pegmatite left by Plumbago in the '90s, and then turn eastward up strike. 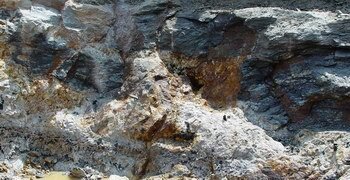 Once we had completed this exercise, we would have a complete fresh exposure of the pegmatite along strike from contact to contact. Based on our observations accumulated as we completed this process, we would be in a good position to decide where to proceed down dip along the 300'+ exposure. While I had been back in Florida at the end of April, Richard, with the help of Mike Robbins, another miner, drilled the remaining schist in preparation for removal. While doing so, they discovered that ,although the schist was consistently 8-10 feet thick, near the center of the overburden the schist suddenly thinned to only 4'. This meant the pegmatite swelled beneath. Our experience had taught us that these swellings portended a sizable pocket. In the image above, the area that had thinned out was immediately behind the bucket laying on its side. Adding credence to the idea was the rusty area below the bucket. I did not dare to believe, though, that such a pocket might exist. Mining requires near blind optimism. It is best managed with a prophylactic dose of doubt and skepticism. 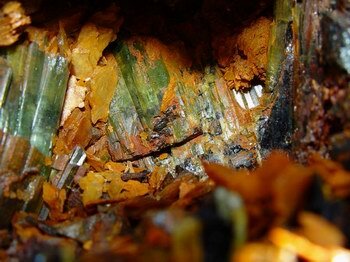 In addition to mining in May, we where on tap to describe our finds found last year in a talk at the Maine Mineral Symposium that ran from May 5-7. Richard and I spent a full day mining on the 5th. That day we encountered pocket number 4 of the season. Cleaning this pocket out took us into the late afternoon and cut into the time I had set aside to prepare for my talk and arrange our exhibit case. 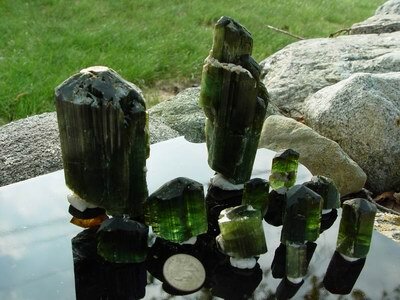 We did find our first gem green tourmaline though. This became our 'pocket piece' at the symposium and was soon to pale in comparison to later finds.